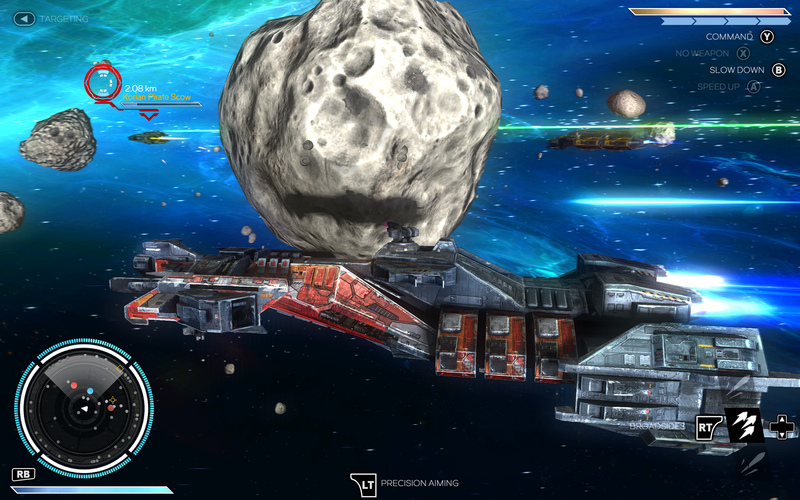 Rebel Galaxy will no doubt appear on players’ radars as a swashbuckling space game with a decided focus on action. While some space games get bogged down with statistics and micro-managing, Rebel Galaxy wants players to experience space up close and personal with intense action. Thinking is also important, but the aim appears to be to make players feel as they are actual spaceship captains navigating through an engaging randomly generated universe. The music also plays a major role in the experience as it captures the essence of the game setting. Interactions play an important part in the game as you can trade, hire mercenaries, start fights, or even be a mercenary yourself. Your actions shape how the NPCs react to you. In fact, the way you decide to play is totally up to you. You can act as an ambitious trader, a rogue with a good heart, a bad motor scooter with a nasty temper, a greedy pirate, or a soulless mercenary etc. Combat is intense and one of the game’s most important features. This should come as no surprise as Rebel Galaxy is the latest game from the men behind Diablo and Torchlight. Diablo’s action was so innovative that not only is elements of it still copied to this day, but the hack-n-slash genre was essentially born from it. With the energy pumping music and all the ways to outfit your flying tank, Rebel Galaxy’s combat is also engaging like those previous games. On the minus side, I would be remiss if I did not mention the lack of multiplayer since GameOgre primarily covers online multiplayer games. The reason why there is no multiplayer is obvious as the world is so rich and tailored to single players. Still, it would be nice for a similar style of a game as a space MMO someday. That would have a lot of potential since the game universe is so vibrant and open. Buy to play that will be $20 on Steam. Alliances with other spaceship captains. Focuses on combat action over strategy. You get to choose your own path to follow and what you want to be from a trader to a mercenary to a pirate to even a hero. Very deep gameplay due to all of your choices. Focuses on combat and action. Offers plenty of depth to go along with the action. Many interactions with different ship captains. You feel like you are a captain of a massive spaceship. The game world is filled with activity and variety. The hard pounding music captures the rebel soul of the game well. Missions are easy to track. Trading adds to depth as you travel. Too much dialogue at times. Sometimes there are great distances to travel between missions. Still has a few bugs that need to be worked out. Rebel Galaxy is a special indie space game. Loved playing Freelancer so I am gona try this game myself and see how it goes. The problem with this game was that it was extremely boring when starting out and the game seems like it focuses more on end game content. You can think of it as the single player version of eve online. Scott Hartley did not rate this post. I love this type of game, I love space games with spaceships etc. SmashPredator did not rate this post. Game is smooth and graphics are real nice. Love the part where you can customize the ship to match your needs. I prefer truly 3 dimensional space games, so the effectively 2 dimensional nature of the game is a downside. But of the effectively 2 dimensional space games this is the best.